The OfficeRunner is the top of the line wireless office headset offered by Sennheiser, offering an upgrade in sound quality, range and comfort over Plantronics CS Series headsets and Jabra headsets. 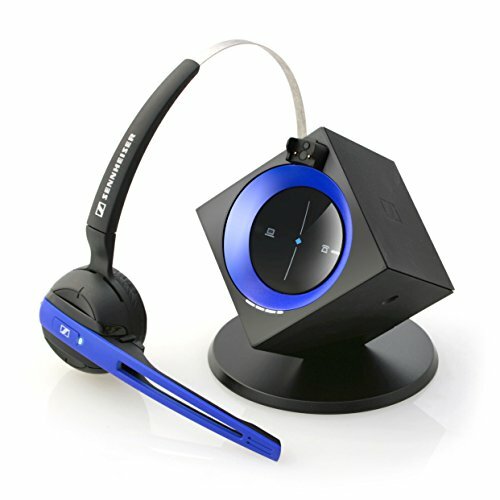 The OfficeRunner wireless office headset lets you talk on the telephone comfortably up to 400 feet away from your desk phone or PC with its long range wireless capability. The OfficeRunner is guaranteed compatible with 98% of corded office phones. Certified for use with softphones from Cisco, Avaya, Microsoft, etc. It's compatible with VoIP services like Skype, Google Voice, and GoToMeeting among more. Works out of the box, simply charge the headset and go! At 0.78 ounces, the OfficeRunner is a light weight wireless headset that can improve productivity up to 43% as well as help your posture while reducing neck and back pain in comparison to hand held devices. With our wireless office headset you can choose between two versatile wearing styles: over-the-head or on-the-ear headsets. The bottom line is that the OfficeRunner wireless headset is the best wireless office headset on Amazon so buy today and enjoy it tomorrow! The OfficeRunner Wireless Office Headset is just 0.78 ounces, one of the lightest wireless office headsets on the market. Comes with an Over the head attachment as well as 3 sizes of On The Ear style loops to make sure you find the style that best fits.